Here are ten questions to ask when planning a digital workplace strategy that’s right for your organization. 1. Why Is the Digital Workplace So Important to the Employee Experience? 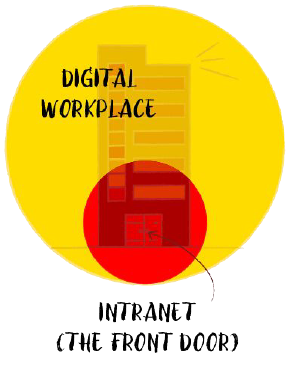 James Robertson, a global authority on intranets, defines the digital workplace as “a holistic set of platforms, tools, and environments for work, delivered in a usable, coherent, and productive way.” The intranet itself is just one element of this environment, and its role has been constantly evolving. The touchpoints that employees have with their workplaces play a vital role in how they stay motivated, informed, and engaged with what they do. Just as technology has become a crucial part of our personal lives, the tech environment in the workplace is of great importance to the employee experience. In this transformative era of hypermodern organizations, competitiveness depends upon the ability to manage effectively through times of change. Especially for businesses with large, widely distributed workforces, rapid innovation necessitates the implementation of modern tools that can effectively keep all employees fully informed. This requirement, combined with the growing focus on work/life balance, flexible hours, and the ability to work from multiple locations, means that companies must provide their employees—including offline, frontline, and non-desk workers—with an employee experience that is mobile. Enabling your workforce to engage with co-workers and information wherever they are and whenever they choose is a difference-maker in the increasingly competitive market for attracting talent and creating the positive employee experiences necessary for businesses to thrive. 2. What's Driving the Change in Digital Workplace Communication? One of the most prominent factors pushing digital workplace communication forward is changing workplace demographics. Businesses are struggling to meet the varied needs of today’s multi-generational workforce as its characteristics continue to shift. Millennials now make up the largest group in the labor force, and engaging this generation has become a top priority. According to a Microsoft study, 67 percent of people use their personal devices at work, regardless of their company's official BYOD policy. This trend continues to expand as employees—millennials in particular—feel more engaged and motivated when they can use their own devices for business purposes. Then there’s the huge topic of non-desk workers. 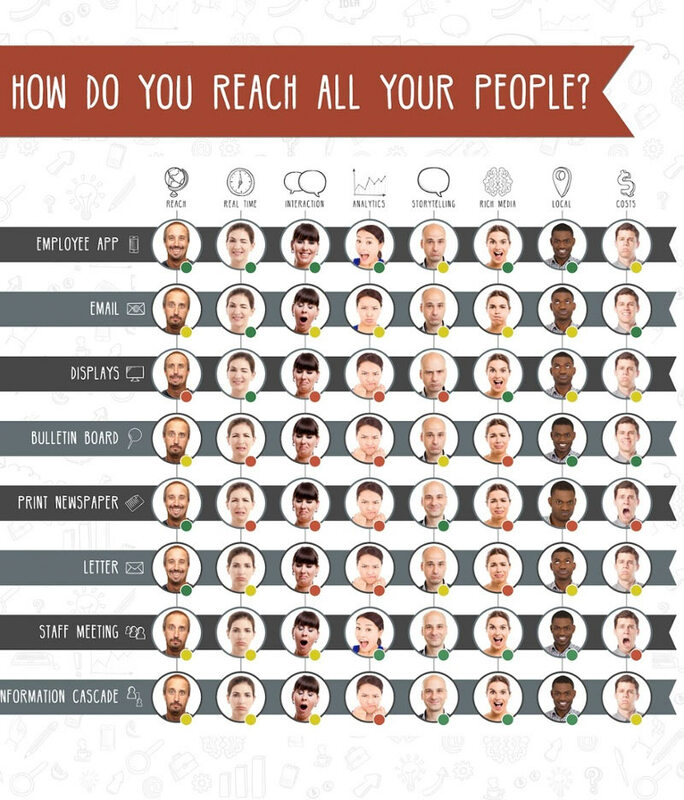 More than 70% of employees don’t sit at a desk and lack access to communication tools. No email, intranet, or any other digital entryway. New challenges cannot be met by limited channels, which is major reason why making digital communication tools available on personal employee devices has become increasingly necessary. Mobile employee communication platforms are now essential for connecting today’s dispersed organizations. In fact, by 2020, there are expected to be 639 million paid users of enterprise social networks. 3. What Are the Main Use Cases for the Digital Workplace? 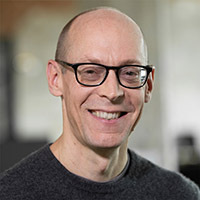 When thinking about the major use cases to be addressed by a digital workplace strategy, it’s likely that most organizations will arrive at similar conclusions: They’ll have a COMMUNICATION part which will include the sharing of various time-critical information; they’ll have a KNOWLEDGE part which is more about structured data where ease of find-ability is a big issue. There will be COLLABORATION part for teamwork; and there will be a PROCESSES part which will generally cover areas like enterprise resource planning, HR, and CRM processes. That's a broad but useful view of the digital workplace. Planning a digital workplace strategy? Here are the questions you should ask first. 4. 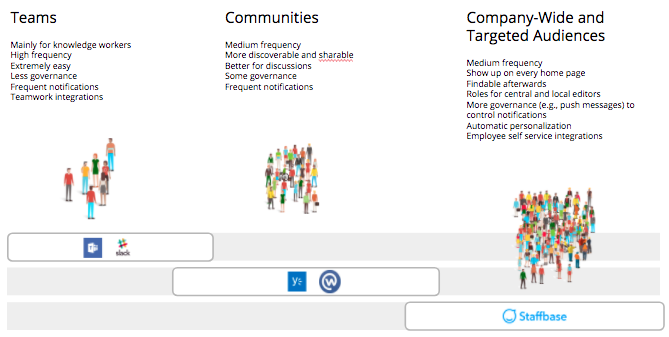 What Are the Main Target Groups for the Digital Workplace? Knowledge Workers are typically seen as being the main users of a digital workplace, and current strategies are often designed specifically for these people. But today's companies still have Process Workers who sit at desks and do jobs in accounting, HR operation, and purchasing. They aren’t working in projects that require collaboration, but they have more day-to-day routines. Then there's the large field of Non-Desk Workers who make up the majority of the workforce in many companies but who have no internal access. To this remote user group you could add Temporary Workers, External Partners, and Others who aren’t under one roof. Until now, these people couldn’t be reached by a typical digital workplace strategies that didn't take mobile devices into account. That's why going mobile on the personal devices of your employees is one of the key requirements in the enterprise digital age. 5. How Do I Match Specific Use Case Needs to My Target Groups? Once you have an understanding of your target groups, you can define your specific use case needs under the categories of Communication, Knowledge, Processes, and Collaboration. Non-desk workers, for example, aren’t likely to have a great need for collaboration tools; they’re not working in project team rooms sharing documents and files, but they will nonetheless want to receive internal communication. They will have certain knowledge needs like a phone directory, safety guidelines, and the employee handbook. As for processes, they’ll want to be able to manage their vacation and personal days, access pay stubs, and be privy to other employee self-services. 6. What’s on Your Digital Workplace Strategy Roadmap? Defining use cases and matching them to your target groups within the company is the first part of designing your digital workplace strategy. Typically you won't have this information available from day one but will instead take a step-by-step approach to creating a digital workplace roadmap. In many cases, companies begin by focusing on communication because it's a common and important need for them. From there they might update processes, collaboration platforms, and so on. Such a gradual strategy marks a major change from just a couple of years ago when companies would attempt to meet all of their digital workplace needs in one fell swoop. More often than not, this would result in exhausted project teams who—after lengthy periods of planning and designing—would barely have the resources remaining to get their projects live and follow up with the necessary improvements that would only become clear following an initial launch. It’s important to remember that a digital workplace strategy is an ongoing program, not a one-and-done project, and its implementation must start by taking into account the internal and external insights of your workforce, followed by consistent pulse-taking and feedback in combination with the digital presence and participation of senior management. What's on Your Digital Workplace Strategy Roadmap? 7. What Are Your Options for Digital Workplace Technology Selection? There’s been an ongoing discussion about whether to use a single platform for your digital workplace or intranet, or whether it’s better to go with a front door intranet approach that gathers an assortment of tools for individual use cases for communications and processes all in one place. 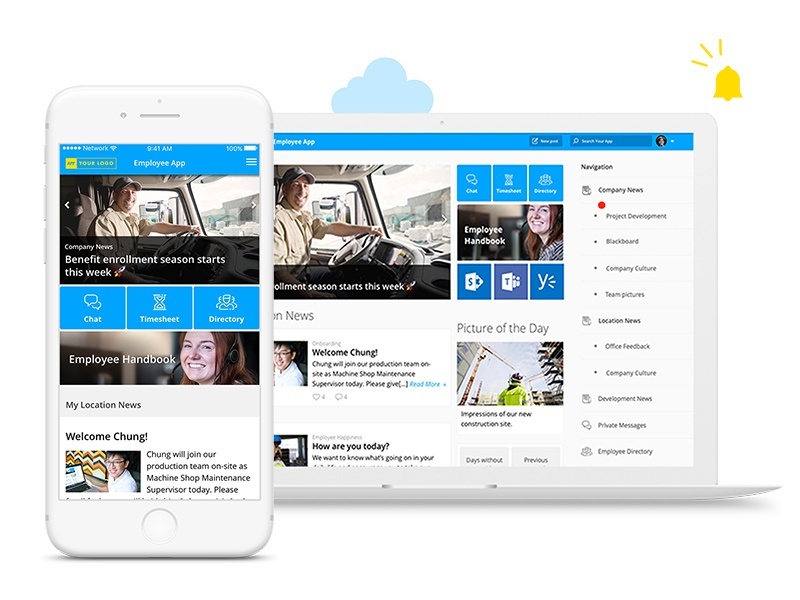 Until recently this was a fairly open question, but given all of the special Cloud tools now available (like Microsoft's Teams, SharePoint, and Yammer), the front door intranet has emerged as the clear choice for providing users with a greater experience than any single platform ever could. A front door intranet also provides more options for BYOD (Bring Your Own Device) approaches because companies can pick and choose from a wide array of tools. Such an approach will provide greater flexibility in the mid- and long term; you can set things up quickly and swap out tools in order to meet your scalable needs. A single platform, on the other hand, will typically disappoint users with poor or limited usability for many use cases. Discouraged users will then often resort to purchasing their own IT to suit their particular use cases. A dangerous repercussion of this scenario is the proliferation of shadow IT and the problems it can create related to security and compliance. 8. What Does Easily Available Mean for Personal Mobile Devices? As discussed, Employee Experience is a major factor to consider when selecting technology. If your solution doesn’t provide a great experience, especially if it doesn't work well in terms of accessibility, users will turn to alternative solutions. This means you’ll still wind up with shadow IT. The second important factor to consider is the question of which use cases should be available for personal mobile devices versus those that need to at least be on company-provided desktop computers. These questions are changing the game when it comes to selecting technology. Supporting mobile users must be part of any successful digital workplace strategy, especially in large, dispersed organizations, allowing for greater connectivity regarding employee communication and productivity—including mobile online meetings, online training, video learning, and more. Apps should be native—widely distributed and easy installed, they provide fast performance and a high degree of reliability. Users shouldn't be required to login every day—after an initial login their app should work just like all the others on their device. The app should include use cases that employees truly care about. Content should be automatically personalized based on the individual user profile (location, business unit, job profile, etc.). Mobile and desktop views of your front door intranet app can feature different tools. When it comes to BYOD, if you want to feature truly practical use cases in your app then they must be available on the private devices of your employees. That said, it’s important to bear in mind that 90–95% of your content will still only be available behind the company firewall on company devices. Rest assured it's going to be secure. 9. Where Do I Start a Conversation and Share Updates? Organizations often question why they can’t use tools like Slack or Yammer as their internal communications tool. The answer is that teams, communities, and targeted or company-wide audiences have entirely different communication needs as a result of their varying sizes. Group chat applications like Slack and Teams can work for collaborative groups and smaller communities. Likewise, community-centric tools like Workplace by Facebook and Yammer aren’t great for company-wide and targeted audiences. For these larger use cases, there’s generally a lot of governance involved. For example, you wouldn’t want to send out ten push notifications every day to a large audience. Rules have to be set in place, just as there have to be regulations about what's visible on your home page, where important information generally must remain for longer than the few minutes it would remain featured with Slack or Yammer. 10. How Do I Stack My Digital Workplace Technology? Given the growing number of specialized, individual tools available today, there’s a clear trend to include several individual solutions within a front door intranet and communication hub. SharePoint was once the only option for collaboration use cases. Now there are multiple options like Confluence from Atlassian and team chats such as Slack, Teams, or Stride. Then there are the communication and networking parts, meaning Yammer and Workplace by Facebook, and email of course remains a huge concern. But what one is beginning to see is that a well-functioning technology stack will consist of tools that are ready-made for specific use cases and are all available via single sign-on where login authentication is done automatically. The user can enter the workplace through their front door intranet and then jump directly to the service that he or she really wants to use. Communication and collaboration are the top priorities of today’s digital workplace. This requires an entirely new approach that takes the employee experience into account and is therefore mobile and highly targetable. 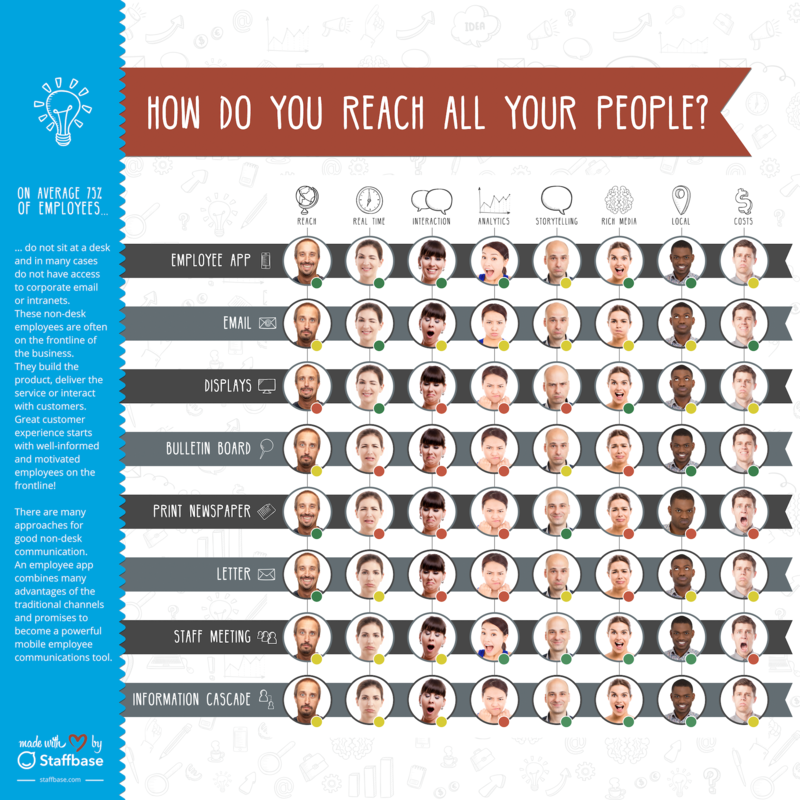 Company-wide and targeted communication isn’t something organizations can do with a blog or a responsive intranet. Especially for organizations with multiple locations and employees who speak different languages, effective communication requires broad yet seamless functionality. The ultimate point of a sound digital workplace strategy is to build a more effective, more efficient business. An employee app is the best tool for this job. More than “just an app,” it will be a central communication hub and front door intranet—with a built-in content management system—that’s mobile but also works great on desktop. Thought of in such a way, all of the pieces of your digital workplace strategy should begin to fall into perfect order.